Ah, birthdays. From your dentist to your boss to your Facebook friends, everyone wishes you a happy one. Plenty of people go all out for their birthdays, staging elaborate parties even as adults, milking each birthday for all it’s worth. For some people, though, birthdays are a source of ambivalence, anxiety, or depression. But they’re unavoidable, coming once a year whether we like it or not. Generally, I’m not that enthusiastic about celebrating my own birthday. It’s not that I hate it, exactly, but I just don’t see the need to make a big fuss about it every year. My birthday happens to coincide with the start of the busy holiday season, too, so my stress is already sky-high. During the November to December stretch, I’m trying to figure out vacation schedules, work demands, and family travel — not to mention Thanksgiving menus and shopping and cooking and cleaning and planning and budgeting and Christmas presents and, well, who has time for a birthday? Since I tend to be the planner of my family and my group of friends, it typically falls to me to make my own birthday plans: picking a restaurant, making a reservation, getting a babysitter. This just adds to my to-do list and stress level. Most of all, though, the reason I no longer look forward to my birthdays as much as I once did is that I’m missing a key person to celebrate with me. My dad passed away in 2003. My birthdays just haven’t been the same since. My mom, of course, always wishes me a happy birthday. But it’s tough when one of the people who helped usher you into the world is no longer there with you to help celebrate the day you were born. I think to myself, wow, it’s been 14 years since Dad died. In another 13 years, I’ll be the same age he was when he died. It’s too bad he never got to meet his only grandson … and so on. There’s also the pressure to meet certain milestones or accomplish key things by some arbitrary birthday. I’ve heard people lament they haven’t checked off boxes of career accomplishments, romantic relationship goals, family ideals, real estate dreams, creative pursuits, or the accumulation of a certain level of wealth by a certain age. The of first-time mothers in 2014 was 26. The average age of a first-time homebuyer in the United States is 32 years old. I didn’t hit either of these “milestones” until I was well past the average age — in part because I live in one of the most expensive areas of the United States, but also because I simply did these things on my own timetable, when I was ready. But maybe your birthday causes a fear of getting older and facing your own mortality. This is a legitimate anxiety shared by many. One study found that birthday stress made people with a history of high blood pressure have a higher chance of having a stroke or heart attack on their birthday. The study also mentions a woman who developed anxiety symptoms around her 75th birthday — because her mother had died at 75. Personally, I have a few ways I try to make my birthday more pleasant. I try not to overplan things or cram too many events into one day. I tell myself it’s OK to miss my dad and be sad on my birthday. If someone goes to the trouble of wishing me a happy birthday or giving me a cake or gift, I try to accept it graciously and appreciate that people are thinking of me and wishing me well. I also think about some of the benefits of getting older. A few studies have shown that there are perks that come with aging. One study in adults between ages 21 and 100 found that there was an improvement in self-reported mental health in the older group. This means there’s often a steady boost in mental health as you get older. Another study found that younger people were more neurotic, while older adults were more likely to demonstrate less negativity. Whatever the reason for your birthday stress or ambivalence, I think it’s fine to mark the occasion of your birthday in a way that feels right to you. If you’d rather sit home by yourself reading a book, you should (in fact, that’s pretty much my ideal day). You might have a better birthday if you take some time to reflect on why you dislike this day, what it means to you, and what you can do to make yourself at least dread it a little less. I’m a big believer in the saying, “Help yourself by helping others.” Try asking others to donate to a charity in your name in lieu of gifts. Take the day to volunteer in your community. 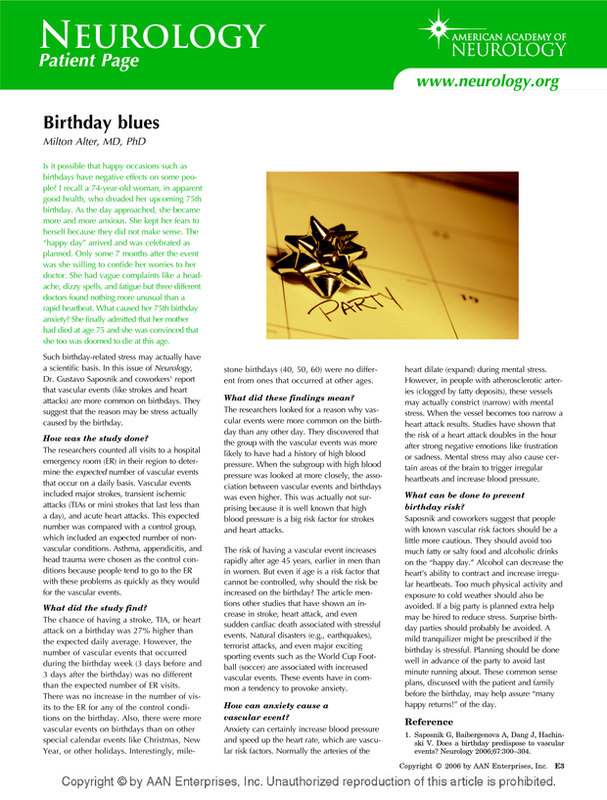 Spending time in nature, hanging out with kids or pets, or getting exercise are also some good birthday-blues busters. Avoid FOMO — Don’t compare your celebration to others. Whether you decide to add your birthday to social media or not, be ready to handle the response or lack thereof. For me, I ask that instead of a “Happy Birthday,” my friends wish me a “Tolerable Birthday” — or at least respect my desire not to have a huge birthday bash.